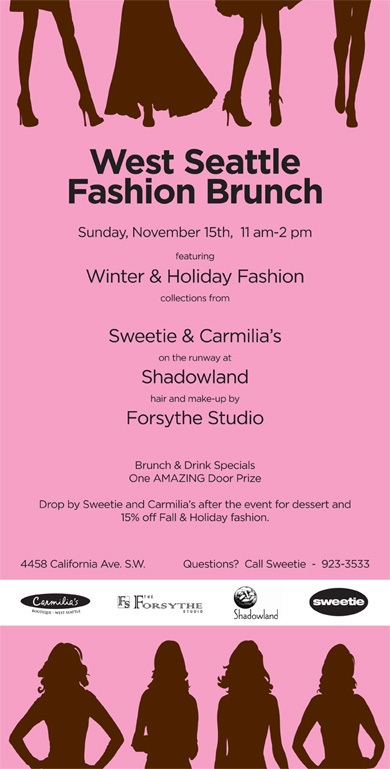 Sweetie and Carmelia’s are teaming up with Shadowland and The Forsythe Studio for a fashion brunch showcasing Winter and Holiday fashions with models done-up by the talented stylists at Forsythe. The event is free and Shadowland will have their delicious brunch menu available for purchase. There’s an amazing door prize to tempt you and both Sweetie and Carmelia’s will be offering 15% off selected items following the event. 21 and over only, please.